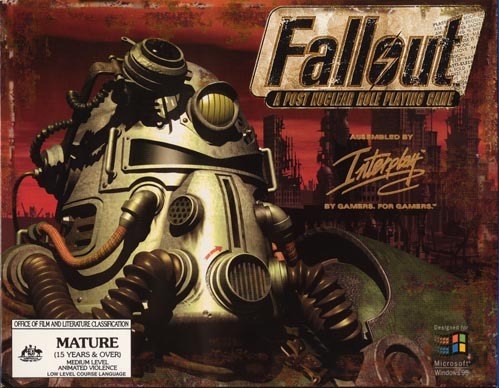 We are all fans of Fallout 3, New Vegas and all its DLC’s but there are most gamers out there who simply jumped to the series when they bought an XBOX / PS3 or even a new PC but most of them jumped straight to the FPS but most of them completely missed out the first game which was released back in 1997 for the PC, while most people would think that a game from 1997 would be difficult to run on modern day hardware and OS’s but GOG.com is a special site which helps keep the retro video games alive and even provides support for the games they sell so that they can run on Windows 7 32 / 64 bit. 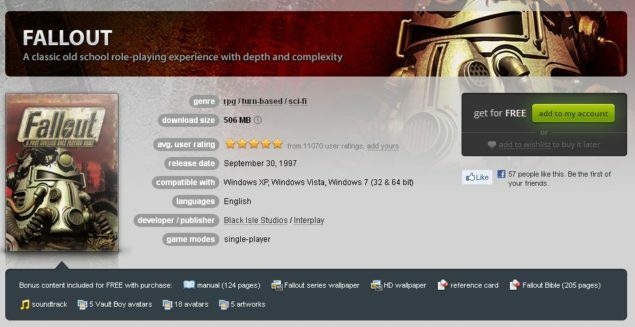 GOG.com is doing an amazing offer for ONLY 48 hours, they are offering the original Fallout video game released back in 1997 FOR free, the only catch is you have to make a free account at their website by going HERE and by choosing “add to my account” you will get a notification to either login or make a new account and voila the game is all yours. To make the deal even more better GOG is throwing in FREE bonus content with the video game too such as HD Wallpapers, manuals, the Fallout Bible, Avatars and much more. This is a very generous gesture from GOG and its only available for the next 48 hours or so, I highly recommend you grab this gem PRONTO before you miss your chance and be sure to share the link with all your fallout friends too. Once again you can go HERE to get the game for free, do leave a comment and tell me whether you would like to see more posts like this in the future or not.